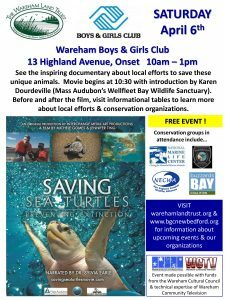 Join the Wareham Land Trust and the Wareham Boys and Girls Club for our FREE 2019 Sea Turtle Expo, including a viewing of the documentary Saving Sea Turtles. Narrated by renowned scientist Dr. Sylvia Earle, Saving Sea Turtles tells the larger natural history story of the world’s rarest sea turtle, the Kemp’s Ridley, and how humans pushed a healthy population to the precipice of extinction and are now slowly helping it to recover. From the beaches of Massachusetts to Mexico, Texas and Georgia, this film highlights the collaborative work that is being done to save a species from going extinct. The screening will begin with an introduction from Karen Dourdeville from Mass Audubon’s Wellfleet Bay Wildlife Sanctuary. 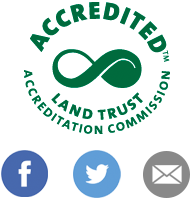 Before and after the film, visit informational tables to learn more about local efforts & conservation organizations, including the National Marine Life Center, the Wareham Department of Natural Resources, the New England Coastal Wildlife Alliance, and the Buzzards Bay Coalition. This event is made possible with funds from the Wareham Cultural Council & technical expertise of Wareham Community Television.